Stacy Horn » Blog Archive » Single People Bad? I belong to a city gym that has been closed for a few weeks while they renovate. It used to be called the Carmine Street gym, but they renamed it the Tony Dapolito Recreation Center, presumably after somebody really great named Tony Dapolito. (This is also the gym where the pool scene in Raging Bull was shot, I think.) I found this great photograph of the outdoor pool. I will go by and take a picture of what it looks like today. When I stopped by and asked when they’re re-opening I was told maybe Friday, but Summer hours will be in effect. They’ve always had something called family hours. I cannot be in the gym during family hours. I figured it’s so that for a couple of hours a day they don’t have to be on guard for possible predators. I don’t know. I’m guessing. Families don’t like to be around single people? It’s annoying because kids don’t use the parts of the gym I use. Can’t they just restrict me from the pool and the basketball courts and other kid favorites? Whatever. I can live with compromise. But all day every day?? That’s just not fair. And really, why can’t I be in the gym when children are in the gym? What is the reasoning behind it? Weekends, single people are okay, except for “Youth Weekends,” and it doesn’t say how many of those there will be. Brava to you for filing a complaint! 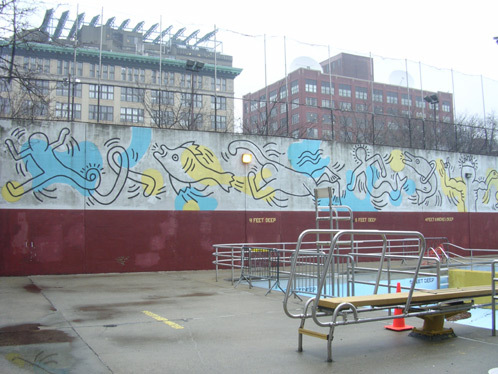 And that’s a nice picture of the Keith Haring mural on the side of the pool. Thank you so much! And yeah, great Keith Haring, which is weird. He’s been dead for so long, and I don’t remember it being there years ago.